Custom embroidered denim shirts continues to be our customer's favorite for casual wear. They wash well, embroider well and are soft and comfortable. Casual for everyday, yet dressy enough for the office. 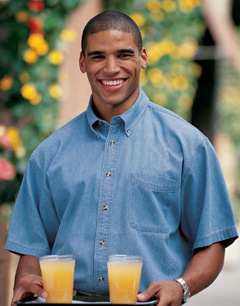 Promote your business with a custom embroidered denim shirt. Harriton, Port & Company and Port Authority Signature brands. Long sleeve or short sleeve denim available. Excellent value for your money and our customer's favorite! Custom embroidered M550 Harriton Mens Denim Shirt is a 6.5 oz, 100% cotton indigo denim. Signature horn-style buttons with Harriton logo and contrast thread. Signature twill tape at neck. Fully constructed front placket. Pocket. Inside flat felled seams. Elegant khaki double-needle top-stitching. Custom embroidery is included! 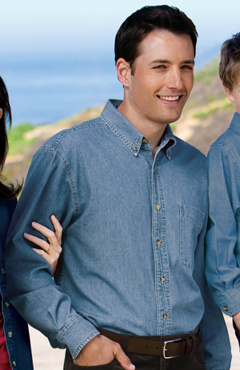 Port & Company® - Long Sleeve Value Denim Shirt. SP10. 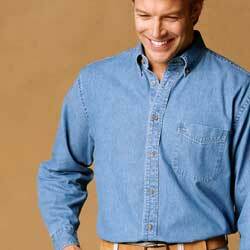 This custom embroidered Port & Company® - Long Sleeve Value Denim Shirt. SP10 is much like the Harriton listed above except it offers two color choices. (Faded blue (shown) and Ink) It also offers a wider range in sizes. 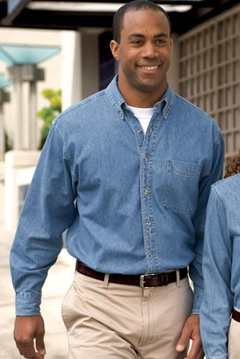 Like the Harriton, the Port & Company Denim shirt is of sturdy construction and a value that won't stretch your budget. Custom Embroidery Included! 6.5-ounce, 100% cotton, Double-needle stitching, Button-down collar, Patch pocket, Horn-tone buttons, Tuck-in tail, Button-through sleeve plackets and adjustable cuffs. Custom embroidery Included. The S600 Port Authority custom embroidered denim shirt is just a step above the value options above. Limited to the color shown. (faded blue) Unlike the other custom embroidered denims on this page, this style offers a TALL style to match. Custom embroidery included! 6.5-ounce, 100% cotton ,Double-needle stitching, Button-through sleeve plackets, adjustable cuffs and back pleat on long sleeve styles, Button-down collar, Patch pocket Custom embroidery Included. Tall Sizes Available! 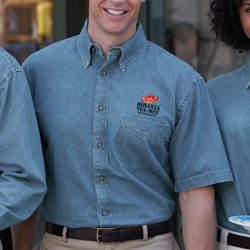 Harriton's best custom embroidered M550S Harriton Short Sleeve Denim Shirt . Same value and quality as it's counterpart the long sleeve M550. 6.5 oz, 100% cotton. Signature horn-style buttons with Harriton logo and contrast thread. Signature twill tape at neck. Fully constructed front placket. Inside flat felled seams. Elegant khaki double-needle top-stitching. Custom embroidery is included. Port & Company® - Short Sleeve Value Denim Shirt. SP11. Custom embroidered Port & Company® - Short Sleeve Value Denim Shirt. SP11. Fantastic short sleeve option to the SP10 version listed above. Sturdy construction and value on this custom embroidered Port & Company Denim shirt. Great bang for your buck! Custom logo included. Offered it two color options. 6.5-ounce, 100% cotton,Double-needle stitching, Button-down collar, Patch pocket, Horn-tone buttons, Tuck-in tail. Custom Embroidery included!